Other than using google maps, you can check our Local Map grid reference for the location, and the distances mentioned below are from Château Bauduc. Fair enough, this is No. 1 primarily because of the proximity. La Table is in the main square of our local town and has a small frontage, with a large garden at the back with tables in summer. A charming young couple bought La Table in early 2014 – Julie runs the front of house - and it’s a popular spot. The modern French food, based on lots of feedback (in 2018) is very good and our advice is to book earlier rather than later. The weekday lunchtime menu for about €17 is good value, the dinner à la carte too and there’s a fair wine list. Open six days a week in summer, but do phone to check/book. A popular and busy restaurant, which serves pizzas as well as modern French fare. Strong wine list, not especially cheap but the big plus is that they are open every evening, whereas most are shut on Sunday and Monday nights. It is easy to find - on the left hand side of the main road in St Germain on the way from Créon to Libourne, about 10 minutes away from Bauduc. Under new ownership - with the Perse family of Chateau Pavie and the Hostellerie de Plaisance. A huge improvement and this very good, fairly down to earth restaurant – it looks like a wine bar - is now well worth going to if visiting Saint-Emilion. Excellent food, a solid, extensive wine list and efficient, friendly service. There’s an enclosed garden area with plenty of tables out the back. Advisable to book well ahead. Bought by the owners of Château Angelus, Le Logis is now a popular upmarket destination. It’s in a lovely location in the heart of St-Emilion, with a charming covered terrace as well as several dining rooms. It is much smarter than it used to be, with prices to match. The food is really good, Michelin starred, and there’s an extensive wine list. There is a handy corkage policy. Located next to the Dordgone river, just by the main bridge in Branne that connects St-Emilion to the Entre Deux Mers, le Café Cuisine has an excellent lunchtime menu that’s great value. More expensive in the evening, of course, but they serve good, classic food – notably the steak, or côte de boeuf. You have to like steak-frites and the wine list is restricted to one or two Bordeaux reds and rosé. The finely sliced beef arrives on a silver platter in a delicious sauce, and the second helping of frites is welcome and dangerous. For best results, order the beef ‘à point’ (medium rare) or ‘saignant’ (rare). There’s a wide choice of classic puddings, like the famed chocolate mousse or profiteroles. No bookings are allowed and as this is the busiest place in town, queue just before midday for lunch or for an early supper at 6.45pm (doors open at 7pm) or you could have a long wait. Proof that keeping it simple really works if the product is right. A very good, dependable brasserie in the centre of town, in a fine location. A solid choice if you’re looking for classic French food in a busy, typically French restaurant on one of Bordeaux’s finest streets. The round tables for 5 or 6 people in the window are fun spots to book if the number fits. Reasonable wine list, with best values around €35-50 a bottle. The best hotel in the region that’s set in the vineyard of Smith Haut Lafitte and well known for its fabulous Vinothérapie spa. There are two good restaurants – the Michelin-starred La Grand Vigne – but the less formal La Table du Lavoir has a charm about it. Good wine list but very pricey in parts. We keep Bauduc at La Table du Lavoir in our private wine box, so Bauduc regulars who ask us nicely, well in advance, can enjoy a bottle for free. On the coast and a firm favourite in the summer – open July and August. You must book ahead and it’s worth the long drive - but not at the busiest times - for lunch or supper, when combined with a day trip or a long stroll up the beach. Super spot with views out to sea and simply great seafood – try moules cooked in oil, garlic, bacon and breadcrumbs, with frites, followed by fresh, grilled turbot. Relaxed and informal. Some good Entre Deux Mers and Graves whites and fair prices. Weekends only out of high season, closed winter. Do book ‘sur la terrasse’. Gavin took Rick Stein there to film his ‘Long Weekend’. Excellent, quite large summer-only beach restaurant, near Arcachon. Must book, especially for the outside tables. This place has mixed reviews but we’ve been many times – in sunny weather, mind - and always had a good time with family and friends. Reasonable prices with lots of choice from burgers to tapas to fish and seafood, and good wines too without crazy prices. (Château Tour de Mirambeau dry white an easy choice). Plus a terrific view out from the beach to the Bassin and the sea. 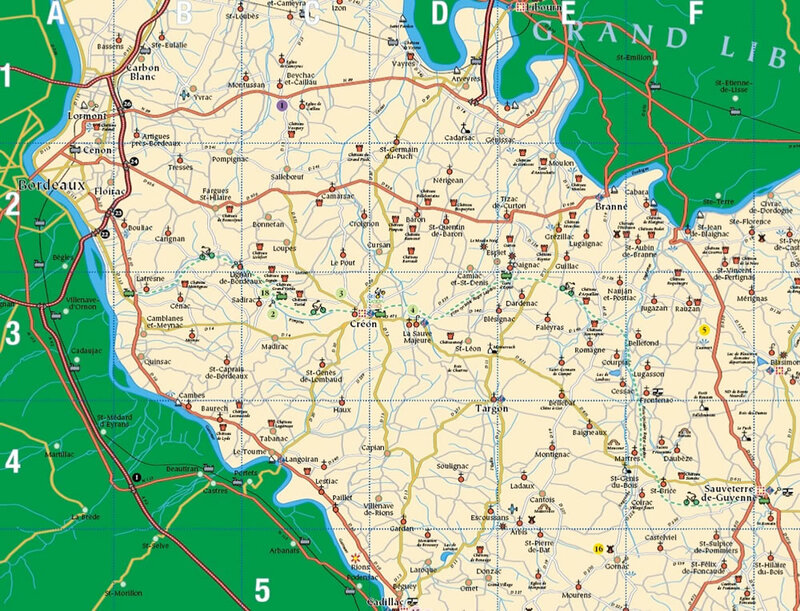 See the Local Map grid reference for the location. Distances are from Château Bauduc in Créon. A popular and busy restaurant, which serves pizzas as well as modern French fare. Strong wine list, not especially cheap but the big plus is that they are open every evening, whereas most are shut on Sunday and Monday nights. It is easy to find - on the left hand side of the main road in St Germain on the way from Créon to Libourne, about 10 minutes away from Bauduc..
A lovely restaurant near the Dordogne river, a few miles south of St-Emilion. The Auberge has been run by Manuela and Thomas L’Hérisson since 2010 and on the evidence of just one dinner, they’re doing a great job. Ask for a table on the verandah, which is the slim room facing the river. Michelin style dining and a pretty good wine list. Stunning location in sunny weather, especially before sundown, right on the river Garonne, 15 minutes south of Bordeaux centre and the same distance from Créon. The food is pretty good without being exceptional although it’s been good for groups that we’ve booked in. Mixed reports in 2015 – some have felt the c. €40 menus are expensive. It’s the location that makes it. An authentic, unfussy French country restaurant and well worth the detour. Frédéric Jombart cooks delicious, genuine food. We’ve never had a bad meal here but it’s a while since we’ve been. It’s in a rural setting south of Castillon, in the valley below Pujols, with outside tables in the summer. Popular with the Brits out that way near the Dorgogne. Good if limited and slightly pricey wine list. Closed Monday, and Tuesday out of season. A quiet, family run restaurant in a village in the middle of nowhere, towards Sauveterre. Some nights you have to make your own atmosphere, so it’s more fun as a group of four plus than if you go as a hushed couple. The quality of the regional cooking more than makes up for it – the wine list is ok and you bring a bottle if you take one from the list too. Or there’ll be a small corkage fee. This is a good restaurant on the edge of the fairly picturesque town of Cadillac, by the bridge over the river Garonne. The 13 and 20 euro lunch menus are well worth it, with two slightly pricier menus and à la carte in the evening. Good wine list with some local values. One of the better known boutique hotels of the Bordeaux region with 15 rooms, it has a smart, Michelin-starred restaurant with an outdoor terrace and a modern dining room. Good wine list. There’s also a popular bistro, which we’ve enjoyed lunch at. On the river Garonne, a good inexpensive spot in summer for lunch. Good location. Good value for lunch. Under the arches in the town square. We used to go a lot. Recommended by visitors and friends for lunch. on the cycle track. Recommended for a great value lunch when cycling. Hundreds of restaurants are reviewed on TripAdvisor, but here are just a few we’ve been to. You’ll find all these online at google maps. The Bordeaux postcode is 33000. L’Entrecôte Cours du 30 Juillet No bookings – queue. A great place in Bordeaux for a (non-vegetarian) family, near to Le Grand Theatre and opposite the merry-go-round on Place Tourny. You have to like steak-frites and the wine list is restricted to one or two Bordeaux reds and rosé. The finely sliced beef arrives on a silver platter in a delicious sauce, and the second helping of frites is welcome and dangerous. For best results, order the beef ‘à point’ (medium rare) or ‘saignant’ (rare). There’s a wide choice of classic puddings, like the famed chocolate mousse or profiteroles. No bookings are allowed and as this is the busiest place in town, queue just before midday for lunch or for an early supper at 6.45pm (doors open at 7pm) or you could have a long wait. Proof that keeping it simple really works if the product is right. The best known restaurant in Bordeaux. The traditional South West cooking and classic décor, set in a narrow cobbled street behind the quays, has as many distractors as fans. There’s a car parking service and they will allow you to bring your own wine if you ask in advance, for a charge - the wine list though is seriously toppy. Corkage, or droit de bouchon, is €30 for non-Cru Classé, or €50 for a Cru Classé wine. We have had both really good and indifferent meals in recent years, but most recently it was excellent, though the ‘bought in’ desserts aren’t great and it is expensive. Recommended though for its atmosphere, cooking and the uncompromising menu of classics. This is Gordon Ramsay’s fine dining restaurant – not his brasserie - inside the smartest hotel in Bordeaux, and a terrific location opposite the Grand Théatre. Based on one dinner that we were treated to in 2018, the food was sensational and utterly delicious. The service too was excellent. As can be expected at this level, it is a properly expensive restaurant, with a wine list to match. A friend told me that corkage can be had for €70 a bottle, which if you take a top bottle of Bordeaux would work out to be good value, relatively. A culinary experience. Only open for dinner on Thursday and Friday, closed weekend, open for lunch Tuesday through Friday. We’ve only been once to this small restaurant – with a wine shop on the street side -- but enjoyed the stylish food immensely. Probably not for those looking for a big rare steak but very fine cooking and clever wine matching. Needless to say, it gets booked up. A very good, dependable brasserie in the centre of town, in a fine location. A solid choice if you’re looking for classic French food in a busy, typically French restaurant on one of Bordeaux’s finest streets. The round tables for 5 or 6 people in the window are fun spots if the number fits. A busy spot in Rue St Remi, the narrow street in the centre of Bordeaux, between the Bourse and the Place de Parlement - an area stuffed with bars and restaurants. Brasserie Bordelais is like a tardis, given the small frontage and substantial interior. Great steak - griddled on the fire – with no shortage of alternatives. Sizeable, well thought-out wine list with plenty of Bordeaux values. The red wine is stored and served a tad warm for our liking, so don’t feel put out if you want to ask for an ice bucket. In the street that runs down the south side of the Grand Theatre, this virtually unknown place serves very good Sardinian food. Big oak tables upstairs are fun for small groups. Delicious mixed starters in jars and the roast suckling pig is a winner. Opposite the Cathedral St André. Great for steak tartare, prepared at the table, washed down with a pichet of good Bordeaux. The waiters have such a superior air about them you might think you were in Paris. Location, location: the outside tables facing the cathedral are fine in summer and the front dining room is classy, whereas the overflow dining room at the back is a bit joyless. A great location, literally on the river on the east side near La Baside, opposite La Bourse. Reasonably-priced ‘steak frites’ formula restaurants that work well, and there is some choice. The small selection of Bordeaux wines is keenly priced. On the ground floor of the Bordeaux wine bureau (CIVB), opposite L’Entrecôte and close to the Grand Théatre. A large, smart bar serving a good selection of Bordeaux wines by the glass, at very reasonable prices. There are often queues to enter. The roof terrace bar on top of the Grand Hotel in Bordeaux, opposite the Grand Théatre, with spectacular views of the city. A relaxed wine bar and restaurant in St-Emilion which has a great value wine list, a tiny kitchen and frequented by local winemakers. You can also take wine for a corkage fee of €5 a bottle. The charcuterie to share as a starter is good, and the plat du jour is always reliable. It’s not a big place, so booking is recommended. It has wifi as well as a big sofa, so it’s a good stop for having a glass of wine or a coffee, and a quick check on your laptop. We went in 2014 and had an excellent dinner with friends. A small, friendly place - low down in the heart of St-Emilion - with a quirky name for Brits to fathom (not a pie in sight) yet no lack of ambition. Classic French cooking with a modern twist. The service, food and wine were all tiptop although, as we were being treated, we didn’t get to see how bad the damage was. The standard dinner menu is around €37. I’d certainly go again. Small upstairs dining room that, until a few years ago, served delicious food and was a big favourite with local vignerons. Since a change of ownership we’ve only been once and found that the new chef tried rather too hard with over-elaborate food. Must revisit. Smart, finely tuned, beautifully positioned hotel-restaurant overlooking the town. It was bought by Gerard Perse, who sold his French supermarket group to buy Châteaux Pavie, Monbousquet and others. The expensive Hostellerie is another piece of his St Emilion jigsaw and is Michelin star-orientated. The food is very good but it’s quite fussy, allegedly. Extensive, expensive wine list. Monday to Friday 8am – 8 pm. We stopped for a late lunch in the 2015 summer heatwave because of the fine location and the cool, outdoor, vapourised fans. If you have a Caesar or Nicoise salad, a cold beer and a glass of good red wine, you can’t go too far wrong. Pretty touristy but does the job well. This little place is what you make of it. Nothing special about the food or the wine but if you have a decent table on the terrace and keep it simple, it can be a charming spot for lunch. Les Belles Perdrix de Troplong Mondot +33 5 57 32 05 Closed for renovations in 2018. 2kms east out of town. A popular new restaurant at this famous chateau, a Premier Grand Cru Classé. Summer visitors enjoy the views overlooking the vineyards from a delightful terrace. And, just as importantly, the food and service by all accounts. We must try it out – let us know what you think if you go. Some close friends thought it quite expensive and that there was a limited choice. 4kms west of St-Emilion on D243 Route de Libourne. Based on a Spring 2015 dinner with friends, the restaurant in this largish, quite gaudy hotel has seriously upped its game. Quite formal in style, it’s classic fare but very good. Some relative bargains for more expensive wines (NB relative). We’ve heard they’ve recruited an excellent chef in 2018, so we should try it. 5kms away from the town, next door to Chateau Cheval Blanc. Enjoyed lunch here on the rooftop terrace in the summer of 2014, overlooking the vineyards of La Dominique, Cheval Blanc and Pomerol. Friendly service and an excellent wine list with plenty of affordable wines. Lots of choice on the menu, although the brasserie-style food was dangerously close to looking better than it tasted. Still, definitely worth a detour. A new restaurant at Chateau Candale near St-Emilion, amongst the vines at Saint Laurent des Combes. There’s a lovely setting on a newly created terrace, ideal for summer lunches. The dining room is a slightly odd mix of modern and traditional. The modern French food though is mostly excellent, based on three recent lunch visits, and pretty good value. (Angela had a poor lunch menu though in June 2013, so it’s not a banker.) Well thought out wine list too, with plenty of choice – with several wines from outside Bordeaux as well. A popular restaurant in a rural spot near Montagne, ten minutes north of St-Emilion. Take the Lussac road out of Montagne and Clos Mirande is marked further on. It’s not cheap – we had the 42€ menu gastronomique – but the food and calm setting are top notch. Catusseau is very close to some of Pomerol’s finest vineyards, bordering on to Saint-Emilion vineyards near Libourne, so this is especially handy if visiting châteaux in the area. It’s worth a detour nonetheless, as the food and service are excellent. The corkage policy is interesting too – if you drink a bottle of Champagne off the list (€60 for a decent one), there’s no corkage fee on the red wine you bring. So that’s perfect for four for dinner. Very good set menus and à la carte. On the main road Libourne to Bergerac road, just outside St-Emilion near the Union des Producteurs co-operative at Bigaroux. Cheap and good lunch spot, and very busy. 10kms by road from St-Emilion. Located next to the Dordgone river, just by the main bridge in Branne that connects St-Emilion to the Entre Deux Mers, le Café Cuisine has an excellent lunchtime menu that’s great value. More expensive in the evening, of course, but they serve good, classic food – notably the steak, or côte de boeuf. All these restaurants are either on or close by the D2 wine route. Traditional and famous lunch stop if you’re visiting châteaux in the Médoc, just north of Margaux on the D2. Classic regional cooking and you can take a bottle of red but not white. (They like to sell an aperitif or wine with your starter.) Some dishes – lampreys stewed in red wine, pig’s trotter and so on - are not for the fainthearted but are pretty tasty. A classic, though on a recent visit (2018) we were a little underwhelmed by the service from one of those superior waiters who ponce around like they own the joint. Perhaps he did. Popular, small brasserie on the D2, near Château Giscours. Summer terrace, good lunch menu (€17 for two courses) and wines by the glass. I took Rick Stein and his TV crew here for his Long Weekend series on BBC, and it worked a treat. Small, classic French bistro and home cooking in a famous Médoc village, right on the D2. Run by an enthusiastic couple, and some good value wines given the location. A lunchtime venue for when you’re visiting châteaux up here. Part of the Cazes empire and tucked away behind Chateau Lynch-Bages in the Village de Bages on the approach to Pauillac. Good bistro-style food and it’s a good idea to book. Also, worth a stop-off for a 9 o’clock coffee before Chateau visits in the area – there’s a bakery opposite for croissants. Best value wine list for Cru Classés in the region, situated on the quais in Pauillac facing the Gironde estuary. Easy to spot with its orange awning. There’s a choice of the bar menu or the full restaurant menu, with atypical food and oversized portions. It gets busy outside in the warmer months so booking is advisable for tables on the terrace. On the quais by the Gironde estuary. Traditional food, efficient service and perfectly good for lunch. The set menu is reasonable value. Stylish, pricey hotel and restaurant (Michelin 2 stars) if you are in the northern Médoc. The dining room is modern, as is the cooking. Even Ramsay’s sommelier baulked at the wine prices. Good value lunch spot for visitors to the northern Médoc, used by local wine people and artisans. Off the beaten track, right on the Gironde estuary near the back door of Chateau Montrose, Meyney and Phelan Segur. Good locals’ menu inside, tourist menu only outside. Traditional, rather stuffy dining room with classic, good food. Expensive wine list. The food is very good here with good seasonal dishes. This being Margaux, the Badoit is €8 a bottle which costs more than the two glasses of wine. The Brasserie, which overlooks the golf course, serves a good set lunch for less than 20 euros. These low-key restaurants might not figure in tourist guides since they cater for local workers and artisans, but all are welcome. Great value at €13 for a full lunch, they can be tracked down easily online at google maps. The standard menu is usually hors d’oeuvres or a starter, un plat du jour, fromage and then dessert. A pichet or glass of wine is included but the standard expresso café is extra. Service is from 12 noon to 1.45pm. Restaurant Les Platanes, Pomerol 33500 30 Route de Perigueux, +33 5 57 51 99 64 on the main N89 near Pomerol, NW of Libourne. Near the turning signposted to Chateau La Croix de Gay. Don’t forget the tarte aux pommes. Get there early. Restaurant La Puce, near St-Emilion 33330 +33 5 57 24 71 18 on the D670, the main Libourne to Bergerac road, just outside St-Emilion near the Union de Producteurs co-operative at Les Bigaroux. Suits blended with overalls. Le Relais de Gascogne, near St-Emilion 33330 +33 557471502 towards Castillon on the D936 at Saint Pey d’Armens. Watch out for the speed camera nearby. Les Marroniers in Montagne St Emilion 33570 +33 5 57 74 60 42 As well as the menu du jour, the salads are huge, and good local wines. Outdoor tables in summer. La Table, Créon 33670 +33 5 56 42 98 40In the town square, La Table is much smarter than a Routier but there’s a super value lunch menu. L’Auberge de la Brune, Camarsac 33750 +33 5 56 30 11 87on the D936 between Bordeaux and Branne. Local artisans and white van workers. Big helpings. La Nouvelle Auberge, Latresnes 33360 +33 5 56 20 72 12 on the D10, north of Latresnes, in the Premières Côtes. Smart folk eating inexpensive, good food in a pleasant spot. Le Saint Martin Langoiran 33550 +33 5 56 67 02 67 On the river Garonne, a good inexpensive spot in summer. We have some vines nearby. L’Entrée du Jardin, Cadillac 33410 +33 5 56 76 96 96 Attractive location by the bridge over the river Garonne. Professional class rather than artisan. Les Arcades, Sauveterre de Guyenne, 33540 +33 5 56 71 50 21 under the arches in the town square. Mixed crowd. Le Peyrat, Port de St-Estephe, 33180 +33 5 56 59 71 43 Near St-Estephe on the Gironde estuary, in the northern Médoc. Menu for locals inside, and (more expensive) tourist menu outside. Close to the back door of Montrose, Meyney and Phélan Ségur. One for vineyard workers - authentic and welcoming. Chez QuinQuin near Macau on the Gironde, south of Margaux – nice café on the water, plastic chairs. Good food - summer only, I think. The café on the Gironde side of the D2 in Margaux, just by Durfort Vivens, near the turn to Château Margaux. The little restaurant by the church car park in Cussac on the D2, between Margaux and St-Julien. In St-Julien Beychevelle, a little resto behind Gloria and St-Pierre, near Branaire Ducru, on the road to Gruaud Larose, just off D2. Big helpings. Last but not least, there’s an excellent boulangerie in Pauillac for baguette sandwiches and so on. Take the quais northbound, and turn left up the one-way street 100m beyond the restaurant Salamandre, which has an orange awning. The boulangerie is 80 m up on the right in this narrow street, and you can find a quiet spot on the quais in the town or better still, further up the Gironde estuary towards St-Estephe, amongst the fishing huts. A relaxed wine bar and restaurant in St-Emilion which has a great value wine list. You can also take wine for a corkage fee of €5 a bottle. The charcuterie to share as a starter is good, and the plat du jour is always reliable. It’s not a big place, so booking is recommended. A popular restaurant with those in the know, located in a rural spot near Montagne, a few minutes north of St-Emilion. Take the Lussac road out of Montagne and Le Clos Mirande is marked further on. It’s not cheap - we’ve had the 42€ menu gastronomique - but the food, service and calm setting are top notch. Closed Monday. A new restaurant at Chateau Candale near St-Emilion, amongst the vines at Saint Laurent des Combes. There’s a lovely setting on a newly created terrace, ideal for summer lunches. The dining room is a slightly odd mix of modern and traditional. The modern French food though is mostly excellent, based on three recent lunch visits, and pretty good value. (Angela had a poor lunch menu though in June 2013, so it’s not a banker.) Well thought out wine list too. The best hotel in the region that’s set in the vineyard of Smith Haut Lafitte and well known for its fabulous Vinothérapie spa. There are two good restaurants – the Michelin-starred La Grand Vigne – but it’s La Table du Lavoir that Château owners head for. Good wine list but very pricey in parts. We keep Bauduc at La Table du Lavoir in our private wine box, so Bauduc regulars who ask us nicely, well in advance, can enjoy a bottle for free. Traditional lunch or dinner stop if you’re visiting châteaux around Margaux or further north in St-Julien, and worth a detour. Classic regional cooking and you can take a bottle of red but not white, which they try and sell you, not unreasonably. Some dishes – lampreys stewed in red wine, a whole kidney, pig’s trotter - are not for the fainthearted but are very tasty. The Brasserie here serves a good set lunch for around 20 euros, and they didn’t mind BYO. Nice spot overlooking the new golf course near the Gironde estuary (turn right after the village of Margaux). Odd that the website for this new hotel and spa is still under construction. Traditional, rather stuffy dining room with classic, good food. Expensive wine list. I once asked a winemaker from a top local estate - who was lunching there at the same time - if the 2002 he’d made, and which was on the list, was ready to drink, and he had a bottle sent over, FOC. Part of the Cazes empire and tucked away behind Chateau Lynch-Bages in the Village de Bages on the approach to Pauillac. Good bistro-style food and it’s wise to book.